Hello to my truly expectant tifosis. So, it is not long now till we are starting a new season of great Formula 1 action, and I, for one, am exciting. But we must also remember there are very serious things going on elsewhere. All this talk of war. I know people are saying that we should get rid of this dictator once and for all and that many people want a regime change. But I ask you, who else is going to be president of the FIA? Max may be banning us from the team orders and hiding my spare car, but he is also thinking up some good things too. As for the team orders, let us just say (here I am winking, you cannot see me, but I am) "we have worked something out." I am reading this fact on a boring plane journey once, please do not think it is the kind of thing I am enrolling to study at night school. If a group of terrorists leave a bomb somewhere in an airport, the announcement over the public loudspeaker is something like: "Will Herr Stoltenberg please come to information to collect his daughter Mitzi." Obviously if someone is saying, "There is a large bomb. Get out! Get out!" much panicking will be caused. We plan to use this method of code messages through our radio system which will now be listened to by the FIA and television publics around the world. If Jean asks Rubens to, "check the brake balance bias", that is the code for, "Schumi is closing fast, make a deliberate error and let him past." If Jean tells Rubens to, "cut back the engine revs" this is his cue to press a special button on his steering wheel. This will the start a trail of oil onto the exhaust making it appear as if his car is about to fail. He will limp to the finish, I will overtake him and everyone will say what a hero he was to nurse his diminishing car over the closing stages. At a team meeting Rubens asked if the same messages applied to Michael. Jean and I both laughed. I was reading a very funny news story also where Jackie Stewart said that he thought Rubens could be World Champion this year. 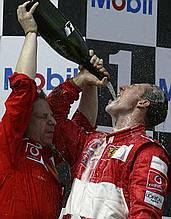 I also remember he once is saying that Jan Magnusson is the next Ayrton Senna. Perhaps he is also thinking that Minardi are the dark horses for 2003 and that Eddie Jordan is going to win haircut of the year. I am honestly appreciated that so many people are predicting me as the 2003 winner already, but as they say in America, the show isn't over till the fat lady signs (which I have never understood - what does she sign?). Until it is in my pocket I do not like to consider the record of Juan Manuel Fangio. I am not interested in record books, the joy of racing is to win and the rush of surging emotion and joy that is coming all over me is enough of a motivation to continue for Scuderia Marlboro Ferrari and to share with my geat hill of tifosis. But almost certainly I will beat Fangio's record. As everyone is making the predictions for 2003 here are some of mine. Most interesting press conference: Raikkonen, Alonso and Wilson all together. It will be so quiet it will be like a library. Shock of the Year: I will not finish on the podium for one race. Possibly Canada.